AntPickax includes open source software products which are necessary for Internet services in Yahoo! JAPAN. It includes basic libraries, components and systems. AntPickax is a series of a challenging product that made it easy to solve complicated problems. We hope AntPickax products are widely used and create next innovations! We will keep challenging to publish new open source software as a AntPickax product(like an Ant working with a pickax). Though we use and contribute a lot of open source software in Yahoo! JAPAN, we have started producing AntPickax with the following background. Basic functions that are necessary internally are not sufficient. Adopting a new architecture to drastically reduce operating costs. Performance (mainly speed and scalability) is insufficient. License restrictions, it can not be introduced inside the company. Among the created software, we have released software as an AntPickax product that has performance comparable to that of existing OSS and has useful functions not found in existing OSS. AntPickax includes the following products. K2HR3 is an RBAC(Role Based Access Control) system that cooperates with IaaS(Infrastructure as a Service). A high performance and horizontal scalable distributed KVS cluster system based on k2hash and chmpx. A component based on FUSE library which can transfer files, texts and logs at high speed and relay them and aggregate them. A vey fast Key Value Store(KVS) library featuring very large file support and many useful functions. A very fast network communication middleware to construct a cluster. 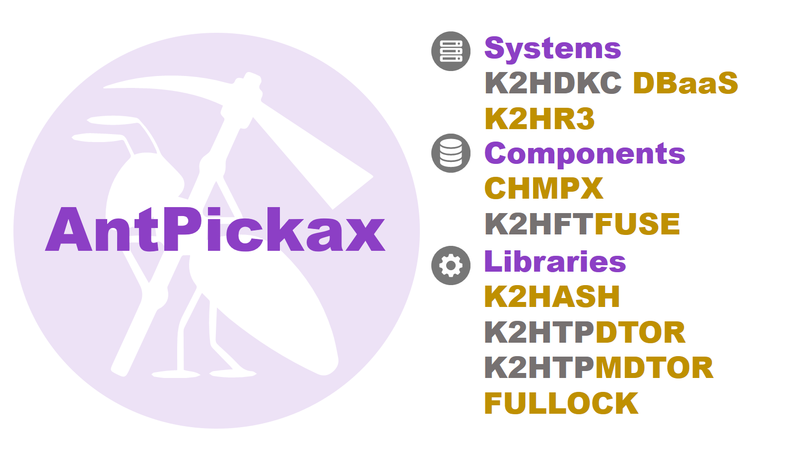 A standard plug-in library for processing transaction data linked to the k2hash library. Another plug-in library for processing transaction data linked to the k2hash library. A very fast and powerful lock library for multithread and multiprocess used in k2hash, chmpx. k2hr3 (K2Hdkc based Resource and Roles and policy Rules) is one of RBAC (Role Based Access Control) systems provided by Yahoo! JAPAN. k2hr3 works as RBAC in cooperation with OpenStack which is one of IaaS (Infrastructure as a Service), and also provides useful functions for using RBAC. k2hr3 gathers common management information for the cloud, and is built k2hash, k2htp_dtor, chmpx and k2hdkc components. k2hr3 consists of the following components. k2hdkc(k2hash based Distributed Kvs Cluster) is a high performance and horizontal scalable distributed KVS cluster system based on k2hash, chmpx Distributed Key Value Store(KVS). The k2hdkc has unique features shown below. Provides automatic merging function of data due to failure/recovery of server nodes in the cluster. Server nodes can be added/deleted to the cluster, and the data automatic merging function at this time is also provided. Provides the association function of key and subkey which is the feature of k2hash as distributed KVS. Provides the queuing function which is the feature of k2hash as distributed KVS. Provides a function that can perform arbitrary processing using data update processing which is the feature of k2hash as a trigger of transaction. Provides encryption function as distributed KVS for the key’s data held as the feature of k2hash. Provides the key expiration function which is the feature of k2hash as distributed KVS. For details, please refer to Codes on github, Documents. k2hdkc nodejs addon（K2HDKC nodejs addon - k2hash based distributed kvs cluster) is a Node.js addon library of k2hdkc. k2hdkc nodejs addon provides all functions and features necessary for the slave side client of distributed KVS of k2hdkc. k2hftfuse(k2hash File Transaction by FUSE based file system) is FUSE (Filesystem in Userspace) is a file/message transfer system using the user space mounting function. k2hftfuse is a system developed to realize reliable and fast file/message transfer at low cost. k2hftfuse provides a virtual file system, you can use it by writing the file to the mounted directory. Just by mounting the directory of the output file of the existing program with k2hftfuse, you can transfer files/messages without changing the existing program. Additional API dependency for client applications is zero! Very fast and reliable file transfer based on k2hash and chmpx. Supported data formats are a single data message, a text file and a binary file. Processing data for your purpose very easily! Invoking your own function against particular data. k2hash is a NoSQL Key Value Store(KVS) library. k2hash has basic KVS functions and unique features shown below. Access to data(read and write) is very fast. The client program can use this library in multi process, multithreading. Can use binary(any types of value) and variable length array(VLA) for Key and Value. Dynamically extends the data area(for data and hash table). Use paging to minimize fragments. Can store data on memory(volatile), persistent file(including temporary file). In the case of persistent files, it provides a mapping method for the whole file(data maintained at high speed and persisted) and index only(large capacity). In addition to KVS’s ability to store values for keys, you can associate other keys as keys to subkeys. Can implement your own processing by triggering data update processing as a transaction trigger. Data update processing can be output as an archive file as embedded transaction processing. Queue(FIFO/LIFO) can be configured as data of k2hash and you can push/pop from it. Attributes(embedded or customized) can be set for the key. Can encrypt the key value and save it. Can keep the update history of the key and this function can be used as a versioning for data. A function that can set the expiration date of the key as an attribute. k2hash nodejs addon（K2HASH nodejs addon - NoSQL Key Value Store(KVS) nodejs library) is a Node.js addon library of k2hash. k2hash nodejs addon provides all functions and features of k2hash. chmpx (Consistent Hashing Mq inProcess data eXchange) is a communication middleware for sending and receiving binary data between processes that cross network. chmpx is responsible for communication between the server program and the client program, and hides the network communication connection from each program. chmpx is a communication middleware that can create a cluster configuration, has high fault tolerance and multiplexing, and can be autoscaled. The format of the data to communicate is free, and it can communicate binary data and large size data. Can multiplex and parallel communication between chmpx server and slave. Data to be transmitted/received is queued and data will not be lost even with small delay due to high load etc. The client program can use this component in multi process, multithreading. chmpx nodejs addon（CHMPX nodejs addon - Consistent Hashing Mq inProcess data eXchange) is a Node.js addon library of chmpx. chmpx nodejs addon provides all functions and features of chmpx. k2htp_dtor(k2hash Transaction Plugin Distributed Transaction Of R epeater) easily duplicates the k2hash data by transferring the transaction data of k2hash to another host using chmpx. This library is a standard transaction plugin library compatible with the k2hash library provided by Yahoo! JAPAN. This provides a general tool for users to process their own transactions as transaction triggers. k2htp_mdtor(k2hash Transaction Plugin Multiple Distributed Transaction Of R epeater) easily duplicates the k2hash data by transferring the transaction data of k2hash to another host using chmpx. The main purpose of k2htp_mdtor, which loads multiple k2hash transaction plugins, is to call the arbitrary function defined in them. When calling the each function, k2htp_mdtor passes k2hash transaction logs to it as a function’s parameter. A common k2hash transaction plugin loads no other one. We recommend you to use k2htp_mdtor if you want to use multiple k2hash transaction plugins. fullock(Fast User Level LOCK library) is a low-level lock library that provides a safe and fast locking function for multiprocess, multithreaded programs. This library is also used by other AntPickax products such as k2hash, chmpx. AntPickax is maintained by Yahoo! JAPAN. Copyright(C) Yahoo Japan Corporation.